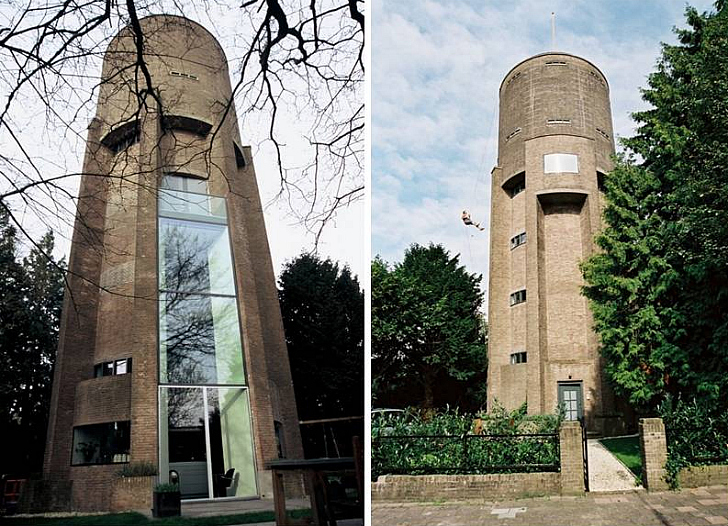 This looming water tower in The Netherlands has been given a new life as a gorgeous nine-storey home. Without compromising any of the building's 1930s character or contemporary style, Zecc Architects transformed the stout Soest tower into a model of sustainable architecture. Read on for a look inside! True to their reputation, the Dutch have pioneered boatloads of eco-initiatives like this extraordinary home built from billboards and umbrellas. In the case of this water tower home, all of the materials were recycled, with not one beautiful red brick lost. A serpentine staircase connects each of the floors (giving the building’s residents a healthy jolt of exercise too.) Long a symbol of unity, the circular shape provides a sense of connectedness. A new three-level high window provides natural lighting to overcome the building’s major design challenge — only tiny windows existed previously. Finally, the top-floor terrace adds a final svelte touch to an already stunning renovation. did anyone notice that guy abseiling down the side of the building in the second photo? cool. Love it, and it could be done here in Israel as well! I think Stephen King is looking to buy. MUUAH-HA-HA-HA-HA. what a lot of stairs!! 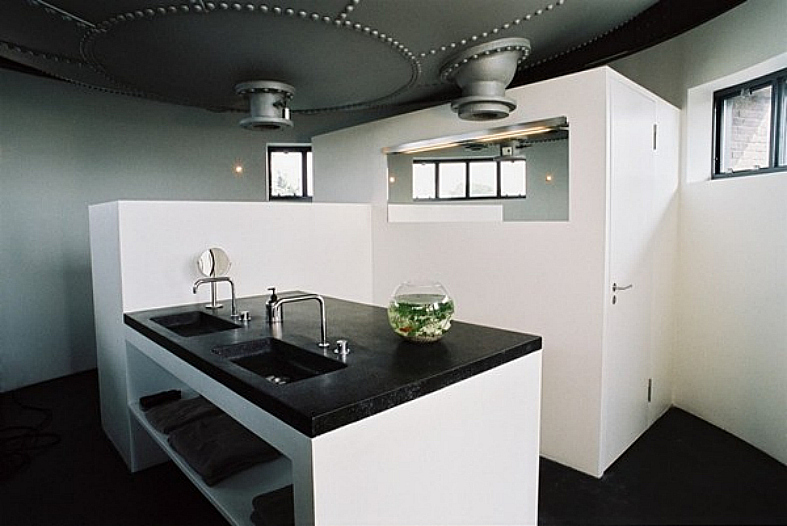 This beautiful black and white kitchen expresses the ultimate in cool Dutch minimalism. In this image both the exterior and interior can be seen simultaneously. The interior fixings maintain the 1930s ambiance sans the drudgery associated with a water tower. Each floor has its own room, connected by the serpentine stairway. Each of the nine floors is individually laid out in this outline. A more detailed plan of the almost stacked-room effect.